Jodie Carey’s work focuses on the traditions of ritual, artifice and mortality in contemporary western society. Themes of memory, remembrance and the fragility of human life thread consistently throughout her practice. Monumental scale is juxtaposed with an intimate and intense craftsmanship that transforms lowly materials into the wondrous and spectacular, offering beauty whilst simultaneously confronting us with the ugliness of life. In the Eyes of Others is a new commission for Towner and represents Carey’s most ambitious work to date. The materials that dominate Carey’s practice frequently reference the corporality of the human body. Her trademark mediums: plaster, used newspapers, human hair, dust, feathers, animal bones, sugar, blood, fat and found ready-mades all come with their own plethora of art historical references, experiential associations and meanings. She deftly weaves together the visceral, physical, visual and emotional subtleties of both material and meaning, often making use of aroma to indicate human presence or a time gone by. In the Eyes of Others centres on three chandeliers, composed from some 9,000 hand-cast plaster bones and weighing approximately one tonne each, making their suspension a great physical feat. They make reference to the spectacle of atrocities shown daily on television screens and in newspapers. The immense volume of newspaper that litters the gallery emphasises the violent and tragic events that most of us will never witness, but which form the basis of much of our understanding of terror and war. However distant these events may be, we all at some point experience the loss of a loved one and this exhibition also alludes to something more personal and fundamental about death – that, like birth, it is an event that cannot belong to us, but rather only to those around us. Carey has worked with trinities of chandeliers earlier in her practice. 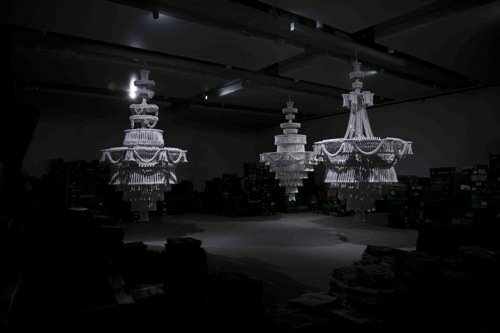 Untitled Chandeliers, 2007, was constructed from dust collected from vacuum cleaners. The dust was manually rolled into centimetre-round balls suspended from wire frames, forming horrifying dreadlocks that signified all that remains of the human body after we have departed - a potent statement about the transience of life. For her installation at Towner, Carey has moved away from precarious organic matter and focuses on the monumental use of plaster - a fragile and brittle material most often employed in sculptural sketches rather than in the finished work. The scale of the installation has given Carey opportunity to develop an immersive space in which the viewer is confronted with the sheer physicality of the objects and the labour intensity of their construction, in exacting surroundings. The chandeliers and the gallery in which they hang are not separate entities; combining with smell, temperature and lighting, they exist together as a singular environment, heightening the viewer’s experience by affecting all of their senses. Materially heavy, the chandeliers drop to the viewer’s level, almost touching the ground. They do not – as chandeliers typically do – soar high overhead, as out of reach and desirable to the observer as the spectacular wealth they represent. Jodie Carey was born in Eastbourne and grew up in Battle, East Sussex. She studied Fine Art at Goldsmiths College and graduated in 2007 from the Royal College of Art with an MA in Sculpture. Her work appears in major UK collections, including the Saatchi Collection, the David Roberts Collection and Hauser and Wirth. Previous works include Still, Life, 2008, Untitled Monument, 2007 and The Daily Mail, 2005. Jodie Carey is the recipient of the Royal Borough of Kensington and Chelsea Studio Bursary Award. She lives and works in London.